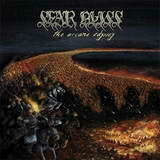 Here is one immediate recommendation to many extreme metal bands just having listened to Sear Bliss The Arcane Odyssey. If you want to add an epic flavor to your metal intensity, look into using some trombone. Somehow Hungarians Sear Bliss have amassed five full-lengths to their credit, after having been around for close to 15 years, but The Arcane Odyssey is my first introduction to the band. Thank you, Candlelight, it is always a pleasure to meet with a group professing their own unique sound. Again, not being a good personal reference for the early days of Sear Bliss, The Arcane Odyssey reveals to me a difficult to categorize, unusual sounding band, which is nevertheless excellent and has the potential to appeal to many a metal fan across genre borders. From extreme power metal (Blood on the Milky Way) to black rock with synth effects (A Deathly Illusion), the best description, however, to the music on The Arcane Odyssey is epic blackened doom. The latter does not appear to take the form of crawly doomdeath so popular these days in Europe, but instead proceeds in both medieval and mid-tempo directions bands like Doomsword and I are currently mapping out. In the span of one album Sear Bliss manage to swing from the astral feeling of unhurried melody on Blood on the Milky Way to the outstanding black rock riff so desperately sought (and never acquired) by Satyricon on Now, Diabolical (A Deathly Illusion). The Hungarians are able to combine the intensity of blastbeat (not overused on the album) and intricacy of piano/acoustics interlude (Blood on the Milky Way). Alas, it is when Zoltan Pal’s trumpet joins the fray, the things reach the appropriate blissful (pun intended) apex. The most powerful moments on The Arcane Odyssey come when stomping double bass is combined with awesomely heavy guitar riffs and trombone resounding hymn-like melodies overhead. It is such moments, making appearance on just about every album track, which make me uncontrollably throw the horns up in the air and scream “metal”. It is such moments which make me think that “metal” and “triumph” can be in many ways synonymous. For aural evidence, check out Thorns of Deception, The Venomous Grace and Somewhere. Sear Bliss is also adept at slowing the pace down, trying to toss and turn the heavy riffs atop some intricate drumming in Lost and Not Found. If Andras Nagy was singing cleanly, the comparison to Doomsword and Antiquus (Canada) would have been quite appropriate, however, the vocalist espouses a very fitting, not over the top, growl which never grows louder than the rest of the music. On Omen of Doom (a very appropriate title) he adds raspy bursts to his voice, making the comparison to Bathory and I complete, especially given the epic nature of the music. And who would know better about the Bathory family if not Hungarians. Throwing in a dash of folk into their epic brew the closer Path to the Motherland begins (after some conspicuously long empty gap?) with a fiery violin melody of chardash before finishing with double bass driven melodic barrage. Both heavy and epic, The Arcane Odyssey certainly reaches above and beyond the standard confines of black or doom metal. The fantastic brass section only helps to magnify the effect, setting Sear Bliss completely apart in the overcrowded field.